A bridge collapse caused by a burst water main has delayed the reopening of a railway station that has been closed for almost two weeks. The majority of services have been disrupted at Bolton train station, while works for electric trains between Manchester and Preston take place. It was due to reopen on Monday but the rupture caused a section of Moses Gate bridge to collapse on to the railway. Network Rail said station would close for another week for safety works. There would then be a further four weeks of disruption with a reduced train service. Major engineering works are needed to make the bridge and highway safe, Network Rail said. Andy Morgan, senior sponsor for Network Rail, said: "We are working round the clock to repair the damaged bridge and get train customers and road-users on the move as normal through this area." 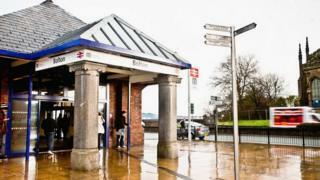 Northern rail will continue to offer its current bus replacement services. Buses will replace trains between Preston and Salford Crescent and run through to Manchester Victoria and Manchester Piccadilly. Direct train services from Preston to Manchester will continue operate via Wigan. Customers are advised to check before they travel.